As you may know, I'm very selective in what I'll post on here for those wanting to advertise. In fact, I removed most of my ads a few months back as I felt they detracted from our purpose. But, once-in-a-while someone comes along and I feel compelled/prompted to share their message. New LDS artist/pianist Garth Smith is one of those. 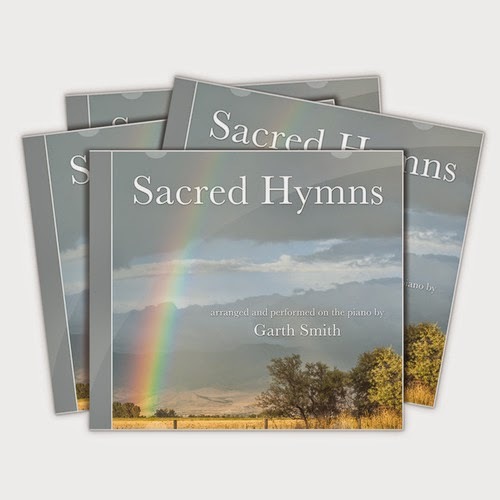 From Oceanside, California, Garth just released his first CD "Sacred Hymns". It's a compilation of 10 original arrangements on the piano, of familiar and favorite hymns; one being a 'Missionary Medley'. I've been listening to them for the past two days and they have soothed my soul. They are uplifting and inspiring and can enhance our Sabbath Worship, Daily driving, and Temple trips. For me, they have calmed me during a time of great challenge. We've recently moved into a difficult circumstance, the car broke down, and…we're having some health crisis. :) So, these arranged hymns have been a welcome relief and blessing. I'm selective in my music choices and hymns are often my first choice anyway. I'm grateful that Garth asked me to review his CD and…with confidence I can recommend his exquisite arrangements. I hope that you will consider purchasing and adding them to your own personal library of uplifting music. You can purchase at Garth Smith Music and there read his Bio, Blog, and listen to samples or Follow Him on Facebook. My thought is that if we can support these great causes and products - we can all contribute to making the world a better place. By helping one another in the work of goodness, all lives are blessed!